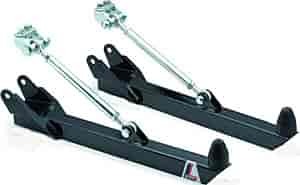 Lakewood Traction Bars work with axle torque to lift and load the chassis. This forces the wheels downward to plant the tires, transfer power to the pavement, and eliminate wheel hop. These bars replace stock lower control arms and are engineered for easy bolt-on installation with no welding required! Does Lakewood 20189 fit your vehicle? 20189 is rated 5.0 out of 5 by 1.